Differential Input, 20 Hz Bridge/Strain Data Logger. 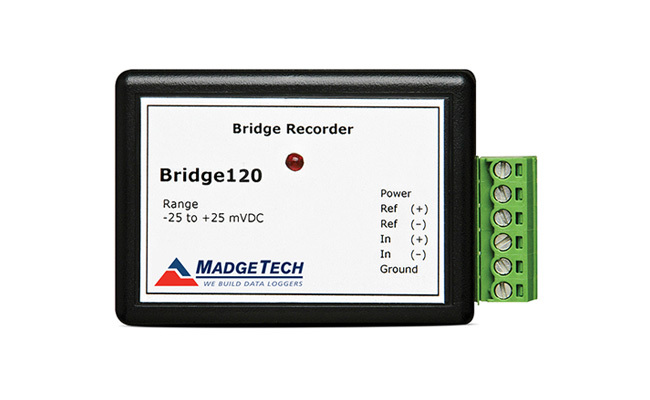 The Bridge120 supplies a 2.5 V excitation voltage and accepts voltage signals from strain gauges, load cells and other low-level, DC voltage sources. SKU: Bridge120. Category: Bridge-Strain Data Loggers. Tags: bridge, strain. 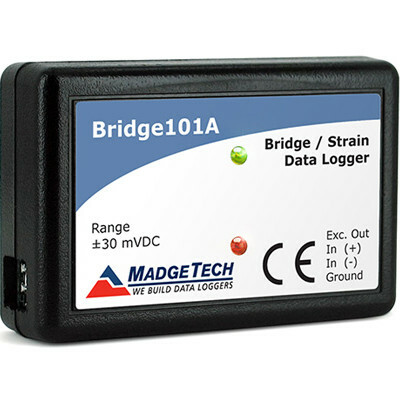 The Bridge120 is a battery powered, miniature, stand alone bridge/strain data logger. The device features a 20 Hz processing speed and a real-time clock module. The Bridge120 supplies a 2.5 V excitation voltage and accepts voltage signals from strain gauges, load cells and other low-level, DC voltage sources. The data logger is perfect for monitoring stress, torque, strain, pressure conditions and data from many other sensors/transducers. User programmable Engineering Units allow the data to be presented in Volts, milliVolts, microVolts as well as the proper units being measured.